The Central Blue Mountains lies between Gundungurra territory to the east and south-east (the great valleys and Upper Blue Mountains) and Dharug territory to the east (Cumberland Plains and Lower Blue Mountains). It is like an island in the middle of the Mountains cut off by deep gorges all around except for narrow access at Bullaburra and Faulconbridge-Linden. If this was an area for ceremonial activity as suggested below, it is possible that it was also neutral and intertribal. Similar buffer territories between language groups are known elsewhere. It is sometimes claimed that the Dharug territory lay to the north of the main ridge and Gundungurra to the south, with the watershed as the boundary. It is true that tribal territories often correspond to water catchments, with watersheds as boundaries: this is because there is then afforded easier access within a people's country. However the reverse would hold true in the Blue Mountains, where gullies and gorges are the real barriers and the ridges offer access. The Blue Mountains have long been a peopled place. This I discovered as a schoolboy at St. Columba's College when I found two stones, one basalt the other chert, which I knew did not occur naturally in the local sandstone. They must have been carried in by hand. Enquiries at the Australian Museum revealed that they were Aboriginal artefacts, a pounder and a chopper respectively. This launched me on a long campaign of archaeological research in the Blue Mountains, comprising systematic surveys and excavations. The oldest artefacts were found in the gravel quarries alongside the Nepean, 15 metres below the present surface. They were choppers and steep-edged scrapers discarded by people foraging among the gravelly channels of the rivers about 50,000 years ago. There was little to impede these hunter-gatherers so long ago from making incursions into the Lower Blue Mountalns and even further. The oldest occupatlon site so far found in the Blue Mountains is in a rock-shelter at King's Tableland with dates of 22,000 and 14,000 years ago. The only full-scale excavation in our area of the Central Blue Mountains was in a terrace just downstream of Horseshoe Falls, Hazelbrook. The tools recovered were all of flaked chert and rather primitive, including cores(cobbles from which flakes have been removed to be fasioned into tools), steep-edged scrapers (used in a planing fashion on wooden tools) and edge-trimmed flakes (variously used for cutting and scraping). Among the latter was a fine example of a thumbnail scraper, with a curved trimmed edge the shape and size of a thumbnail. Such artefacts belong to what has been called the Capertian Industry, which lasted perhaps from 20,000 to 4,000 years ago. The Horseshoe Falls deposit was dated to just over 7,000 years but the tools were very much older. They would have been made inside the rock-shelter, under the present waterfall, but later with increased rainfall, the occupation floor and its contents were washed away and redeposited as a terrace bank a little downstream where they were excavated. The original campsite was occupied at a time of great aridity, when this site was dry enough to be camped in. Tool making technology was not confined to stone artefacts. We know more about stone tools because these are durable while tools of organic material readily disintegrate in our acid soils. However two finely decorated wooden clubs have been found in a dry sheltered spot at Faulconbridge. Among items which were made of organic material but have disappeared from the archaeological record we can think of spears, boomerangs, coolamons, shields, bark canoes, string, cloaks of possum skin. For these we depend on the reports of white settlers but these mostly refer directly to the people of the plains. The campsite (whether in a rock shelter or in the open) was not only the place of sleeping, eating, tool making and social activity, but was also the focus for hunter-gathering in the local area. As well as the routines of ordinary life there are sites showing evidence of a higher life. 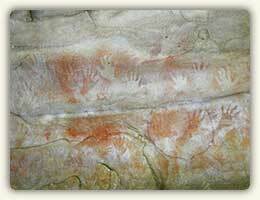 Some cave walls still display hand stencils, ochre paintings and charcoal drawings (mostly depicting animals). There are 24 of these known in our area, and undoubtedly many more now faded, or yet to be discovered. On some of the broad rocks topping the ridges are found rock engravings, in the figurative outline style common to the Sydney region. Readily accessible are the emus and mundoes (stylised foot tracks) at Ticehurst Park and the kangaroo beside Kangaroo Street, Lawson. There are 33 of these sites which we know of in our area and it is thought that they may have played a part in ceremonies and initiation preparation. On the Woodford Ridge is a very old engraving of concentric circles, which, with the tracks engraved on cave walls at King's Tableland and Bell's Line of Road, seem to show inland influence. Also on ridge tops are a few stone arrangements, now rather disturbed, which may have marked out corroboree grounds, as sand mounding did elsewhere in Australia. Very often, in creek beds and beside rock pools (notably near rock engravings) are found grooves where axeheads have been ground to sharp edges. An important and easily accessible site is the cluster of Aboriginal wells beside the Highway at the southern entrance to Gloria Park at Hazlebrook. There were originally twenty wells known there, but some have been covered by road widening. Alongside are weathered axe-grinding grooves and what appears to be a faint engraved outline of a fish. Nearby is a very large rock shelter in which an axe blank was found. The importance of the site complex lies in its being close to the ridge top, which travelling Aboorigines would have used long before it became the route of the first road over the Mountains. For travellers it was a welcome stopover with shelter and water beside the trail. Even Europeans used the site, judging by pick marks on the sides of some wells. A question arises whether Aborigines made the wells, since circular basins are found on nearly all the rock engraving sites I know. One method that suggests itself is repeatedly lighting a fire on wettened rock, causing it to exfoliate and form a depression. The map below shows the distribution of known sites in the Hazelbrook-Wooodford area. Compared to a modern map, it underlines the fact that whereas European settlement is confined to the main ridge and close-by spurs, Aboriginal occupation was much more widespread, following the spurs further and spilling down the slopes and into the shallow headvalleys. Only deep gullies seem to have been avoided. In viewing this map it is well to remember that intense surveying in some areas has resulted in dense clustering in the corresponding parts of the map. It can be assumed that a similar density could be extrapolated to other areas that were equally favourable to human occupation. Expressing site density as the number of sites per square kilometre, parts of Lawson Ridge past Queen's Rd. runs to as much as 8 to 10/km , which is comparable to Asgard Swamp, Sun Valley and parts of Winmale which have been closely studied, and much higher than anywhere else in the state where I know careful surveys have been conducted. 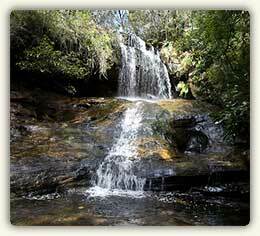 This shows that the Blue Mountains was a region very favourable to Aboriginal living. One peculiarity of the Central Blue Mountains is that while sites occur here as frequently as in the Upper and Lower Blue Mountains, there is a noticeable lack of major sites, that is, ones with an abundance of worked stone. The impression is of many sites being used for short lengths of time. Parallel to this is the concentraion of art sites in the Central Blue Mountains which have led several researchers to suppose that Aborigines resorted to this area for ceremonial purposes. There are two other Mountain sites, similarly placed in shelters now too wet to be occupied, which must have been used at a time of extreme aridity. These are Wall's Cave, Blackheath, and Lyre Bird Dell, Leura, which both yielded dates around 12,000 years ago however these carbon dates are now considered too recent given the likely contamination from gas carbon in the ground water. The arid phase is thought to be older than 17,000 years, perhaps up to 20,000, when the Ice Age was at its peak. It was a time when there were no swamps to slow water run-off, when sand dunes were forming on Newne's Plateau and when in places there was less than 15% vegetation cover. Yet despite the extreme conditions of the Blue Mountains generally would have been relatively moister than country to the east and west and would have served as a haven for all life, plant and animal, including human beings, who camped in rock shelters such as Horseshoe Falls. From that extremity the climate improved, both wetter and warmer, and all life forms began to flourish. From 17,000 the first swamps began to form in the Blue Mountains, checking the run-off of water , slowing erosion of creek beds, forming reservoirs for downstream creeks and hosting valuable food resources. Hence developed the environment we are familiar with today and which was very favourable to Aboriginal occupation. Water was readily available and food resources were abundant and diverse. As essential resources became more abundant the Mountain Aborigines found more leidsure time to spend around the campfire, conversing, storytelling, pondering their Dreaming, preparing for ceremonies, drawing out the intricacies of their kinship system. While social life can only be guessed at, we have evidence that toolmaking now entered an intense phase. More stone was flaked than before and with greater control, producing many more and smaller flakes, some of which were fashioned into beautiful tapering points and sturdy adze flakes. Flattish basalt pebbles were ground to stout edges in grooves on sandstone surfaces. This phase, which is labelled the Bondaian Industry, lasted from 4,000 years ago up to the time of settlement peaking in work-manship about 2,000 years ago. A significant excavation carried out in a rock shelter at Horseshoe Falls yielded chert flakes and scrapers in a terrace deposit which was over 7000 years old. These samples were the products of the Capertian Industry which specialised in the treatment of the working edge of flakes. An advanced item in the Capertian range of tools is the thumbnail scraper, an example of which was found at the Falls. The water-rolled state of artefacts found at the excavation and their position indicate that this material had been displaced from an earlier occupation level on the site and was probably much older. Comparison with other sites in the mountains make a date of 12000 to 14000 years or even older more likely. This rock shelter now too damp for sustained occupation was used by people who would have been experiencing the extremely arid climate of the late Pleistocene period towards the end of the Ice Age. They would have found the area fairly hospitable with shallow valleys, easy slopes, and a supply of water from the many swamps. There are numerous aboriginal sites in the area comprising axe-grinding grooves which are often found near shallow rock pools. Axes were made by grinding basalt pebbles to an edge using water as a lubricant. One such site is at Gloria Park near the Great Western Highway. This site was recently saved from roadworks damage by the construction of a retaining wall. There are up to 30 grooves around a number of natural pot-holes, together with an engraving of a fish (first recorded by FD McCarthy, 1945). It is interesting to note that these wells, providing reliable sources of water close to the ridge-top route across the mountains, would have been used by travellers both Aboriginal and European, the latter having enlarged one of the pools with pick and chisel. A large cave nearby was camped in by both peoples. Although evidence of Aboriginal activity is widespread in the Hazelbrook area, the frequent campsites show fewer artefacts and a more limited range of tool types than in the Lower and Upper Blue Mountains. Father Stockton suggests that the Central Blue Mountains with its narrow ridge top was a transit area between the broader plateaux of the lower and upper mountains which would have sustained longer occupation, probably on a seasonal cycle. Recent investigations have revealed open Aboriginal sites in the higher Mountains where caves and rock shelters are not such a feature of the landscape. These are more difficult to find and even more difficult to date. But it may be that occupation sites are not as sparse as once thought. Further study of habitats and prospective food supplies have shown that there would have been enough resources, particularly in the swamp areas to sustain residence through winter. The artistic expression of the Aboriginal people who sometimes visited the Hazelbrook area would have taken many forms such as dance, song, story, painting. Early European reports regarding Aboriginal art are few and we can only assume that these elements of the culture were as complex and sophisticated as those in other parts of Australia. What does remain is rock art. This occurs on the walls of sandstone shelters as stencils, drawings or engravings, or pecked and abraded engravings on broad, open areas of rock. Stencils can be in red, white or black of hands arms, feet or an artefact. There are some well preserved hand stencils in the northern Hazelbrook area, one set in black, others in the more common red ochre. Stencils are made either by spraying a mouthful of ochre and spittle over the hand or by blowing dry ochre onto a wet area of wall. Apparently the spittle has given the ochre a good staying ability and some stencils in sheltered areas could be thousands of years old. Drawings are usually in charcoal but can be in red, yellow or white ochre. Animals are the main subject. Wall engraving can be tracks or geometric shapes, the most likely motifs being kangaroo tracks and emu tracks. Engravings on flat rock surfaces appear to be more concentrated along the Linden Ridge to the east of Hazelbrook/Woodford. The Blue Mountains has nothing like the number of rock engravings as the Sydney basin, where the lower Hawkesbury and tributaries has one of the richest assemblages of rock art in the world. The number of engraving sites tapers off towards the mountains and the depiction of spiritual figures (Daramulan, Baiame) is replaced by a higher number of tracks in the mountains. Some examples in the Hazelbrook-Woodford area seem to represent natural forms such as men, a human foot, birds, animals such as a wombat, fish, snake and echidna while others are symbolic in form, such as tracks, circles, lines. and crescents. But a drawing or engraving may not be what it appears. What looks like a lizard could be a person in lizard form, and a koala footprint could be the track of the great sky god Baiame. It is futile to try to say what the motifs mean and much more useful to interpret the patterns of site location. This line of art sites has been thought to represent a neutral ceremonial boundary between the people of the Upper Mountains, the Gundungurra (the Cox River people) and those of the Cumberland Plain, the Daruk. Art sites, like all evidence of this history, are precious and nothing should be done to jeopardise their future. If our hands touch stencils, if we chalk engravings or fill them with sand, we might interfere with the patina of age that serves as a protection, 200 years ago. It is difficult enough to piece together evidence of the earliest human occupation of the Central Mountains, but even to reconstruct the lives of the inhabitants 200 years ago is daunting. Few signs of aborigines were encountered by the explorers, perhaps because the aborigines were hiding, had already had their numbers reduced by new diseases introduced to the colony or, were not resident on the mountains at that time. One theory is that at the time of the coming of the white man, the people who frequented the mountains were of the Daruk tribe, whose territory stretched from western Sydney to the Blue Mountains. They lived in a delicate balance with their surroundings, their impact on the environment being minimal. They relied on the fish and bird life of the Hawkesbury-Nepean, although they hunted and gathered food in the mountains as well. John Merriman has identified over 40 plants of the Blue Mountains that could have supplied food to the people before 1788. The three main supplies of food plants were roots and tubers, fruits, and the nectar-producing plants which provided the base of a food chain, tapped into by the Aborigines at all levels. Banksias, grevilleas, hakeas are all examples of nectar-producing plants which could be sucked or beaten to extract the nectar; orchids such as Pteristylis species (the Green-hood orchids) and Thelymitra species have edible tubers; Persoonia (the geebung) and Solanum are but two examples of edible fruits. Although small groups of Daruk moved around according to the seasons and food supply, it cannot be stated with certainty that people would have wintered on the plains and moved up to the mountains in summer, particularly when we consider, for example, that Penrith often experiences lower winter temperatures than Hazelbrook/Woodford. The Daruk were expert toolmakers, whose tools were highly prized by other tribes who traded with them, while their weapons were spears, clubs and ground-stone axes. They wore long skin cloaks of possum fur sewn together with kangaroo sinew. The Daruk painted their faces, arms and thighs for ceremonies, and necklaces of kangaroo teeth and reeds were worn. An early record describes Daruk contact with the white newcomers in 1791 when Captain Phillip's party came to the banks of the Hawkesbury and exchanged greetings with them, peacefully sharing their campfire on the river bank at Pitt Town. When Tench and Dawes attempted to explore the Blue Mountains they were ferried across the river by aborigines in bark canoes. In 1794, 22 settlers took up land along the Hawkesbury-Nepean. Within a year there were 546 people with farms along the banks of the river, who were given military protection because these farms were the main source of the colony's food supply. It was also an important source of food for the Daruk people. Three members of a French expedition, Quoy, Gaudichaud and Pellion in November 1819, while travelling over the mountains to Bathurst encountered aborigines in the Springwood area. Pellion made drawings of them, including Karadra a sick old man lying on kangaroo skins near a fire and receiving the attentions of a younger man. According to Lawson, who accompanied the Frenchmen, Karadra had killed many Englishmen without anyone ever being able to catch him in the act. For a long time, however, this man had been peacefully disposed towards the settlers. These portraits published in Jim Smith's article on Blue Mountains Myths and Realities give some idea of the appearance and names of Blue Mountains' aborigines. By 1821, numbers of aborigines had been drastically reduced, not it is suggested, due entirely to disease but also to the conflict that ensued between new settler and old. Stockton & Holland. 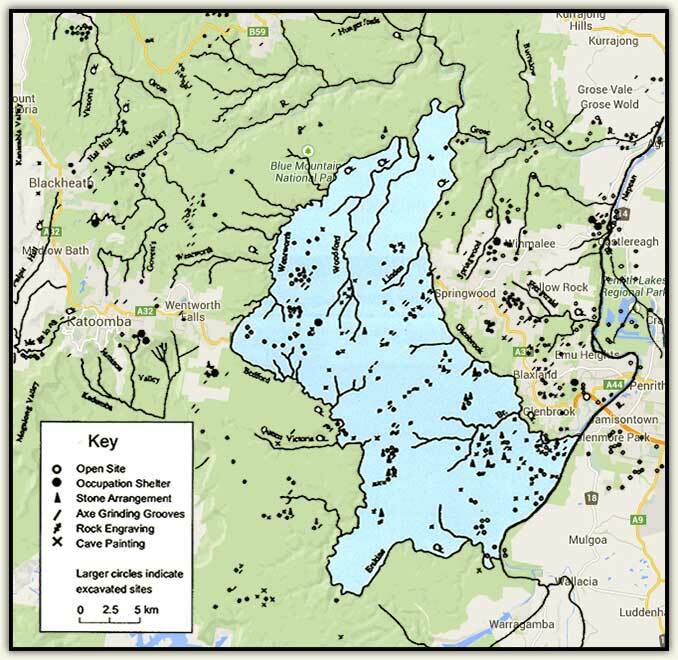 'Cultural sites' and their environment in the Blue Mountains.' APAO 9: 1 April 1974. Nanson, Young & Stockton. 'Chronology and paleoenvironment of the Cranebrook Terrace (near Sydney) containing artefacts more than 40,000 years old.' Archaeology in Oceania, 22, pp.72-78 1987. Stockton, Eugene D. 'An archaeological survey of the Blue Mountains.' Mankind, 7 pp.295-301 1970. Information on art sites supplied by Greg Gaul. Merriman, John. Blue Mountains plants, edible and medicinal. Unpublished, 1988. Ouoy, Gaudichaud & Pellion. 'Excursion to the town of Bathurst' in Mackaness, George. Fourteen Journeys over the Blue Mountains, 1950. Smith, Jim. 'Blue Mountains Myths and Realities' in Stanbury, Peter. (ed). Blue Mountains Grand Adventure for All, Leura, Second Back Row Press, 1988. Signs of human activity in the Hazelbrook-Woodford area go back at least 12,000 years. This is a book about art. More specifically, it is about Aboriginal art. More specifically still, it is a book about Aboriginal art from a limited geographical area. 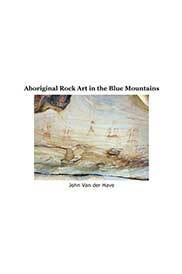 It is a book about artworks created, for the most part, long before the first Europeans ever set foot in that geographical area (to which we refer today as the Blue Mountains of New South Wales). These artworks were, furthermore, produced in a cultural context that could not be more different to the western cultural context in which we find ourselves in Australia in 2016. ...John Van der Have, author.